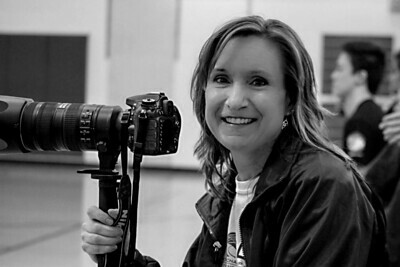 I'm Melanie Crispin and I've been a sports photographer for over 7 years. I started photographing my son's football games and quickly realized how exciting it was to be down on the field and in the action. I've since shifted my focus to the unique sport of competitive jump rope as my two youngest are active jumpers. I love capturing individuals and groups performing a move in mid-air, being able to still a jumper's rope, or simply catching the those truely candid moments. Being down on the floor with the jumpers brings me back into the action but this pails in comparision to the joy received providing you with those proud jumper, parent or family moments when you get goosebumps or fight back those tears and say it was worth all the hard work and commitment!